This week I finished my Harmony quilt. I will finally be able to send it off to my nephew and his wife as their wedding gift. Doesn’t some rule of etiquette say you can give a wedding present within the first year and it is still ‘proper’? According to this post on Manners Monday of the Huffington Post, I am still within the time frame. Though really, who would refuse a wedding gift because it was late? At least I am finally giving it to them!! I wanted to quilt it on a long arm because there is lots of cool negative space and it would have been fun to play with it. However, that just never worked out and in the interest of time and wanting to complete this quilt, I opted to quilt it at home. It is fairly large at 74″ square so I decided against free motion quilting and settled for straight line with my walking foot. I did a diagonal line across the middle. For one side I did vertical lines all the way out and on the other side I quilted horizontal lines. I like the effect. My favorite part of the quilt is the bottom border where I relief quilted their last name and the words EST. 2016. It is a sweet reminder of when they married and established their family of two (plus a couple of dogs!!) As with my other relief quilting projects, I fused stabilizer to the back of the border strip (before it was attached to the quilt) Once the letters were traced on to the border, I used my darning foot and created the design by free motion quilting around the shapes of the letters and numbers. After attaching the border strip and quilting the body of the quilt, I took the darning foot and FMQ’d the outline of each letter and number to quilt that section of the border and make the letters stand out and puff up a bit. On the corners I used a four patch block as a cornerstone. 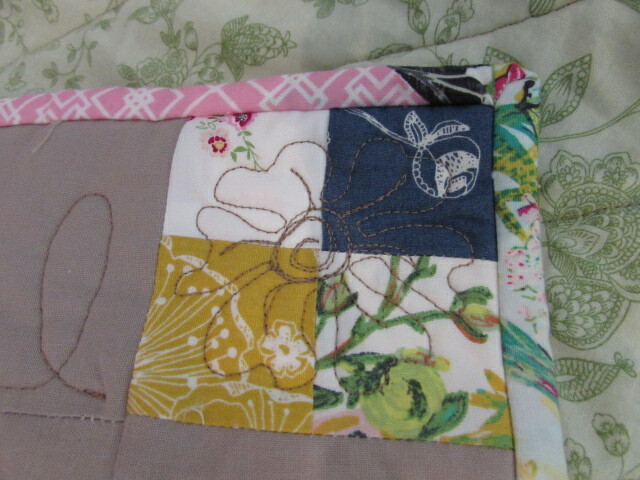 On each of these I quilted a little flower. 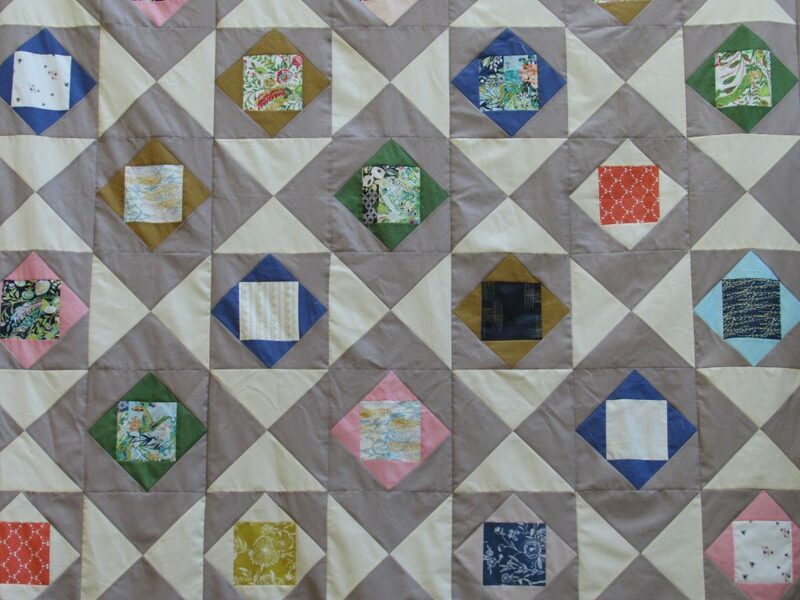 The borders were free motion quilted with a pattern of loops, alternating small and large ones. To finish it off, I made a scrappy binding! I am such a fan of scrappy bindings. 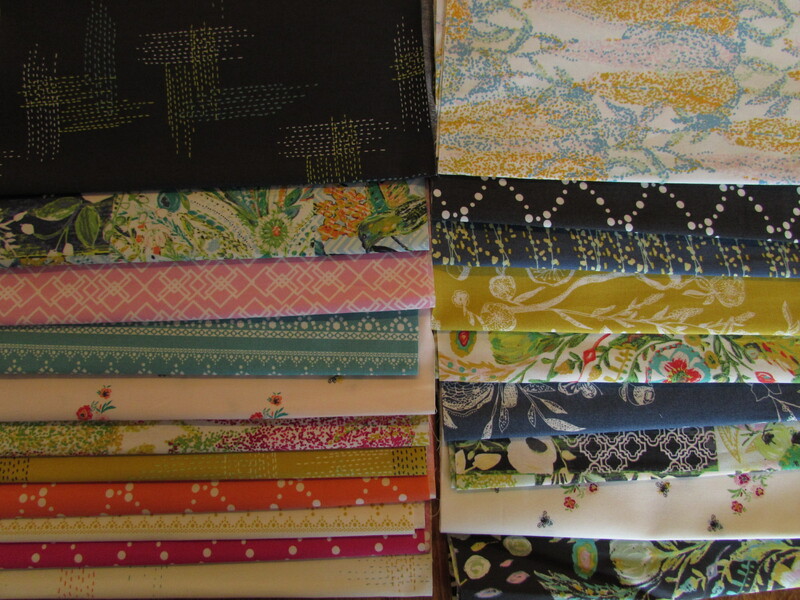 Luckily, I had just enough of the Millie Fleur fabric left to make the binding. I can’t wait for the kids to receive their quilt. I was really sad to have missed this wedding last year. From the pictures they shared, it was just a gorgeous day for my nephew and his new wife. 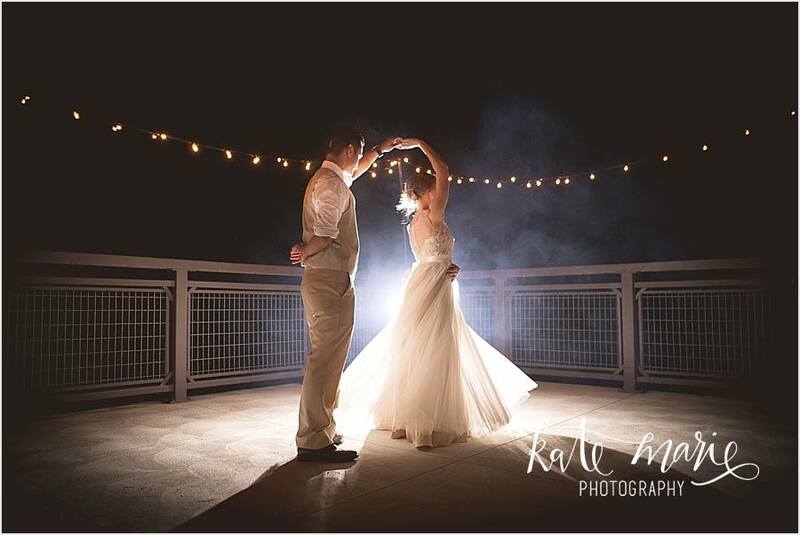 I am sharing a picture of them dancing at their wedding. Breathtaking, aren’t they? I hope they love the quilt and use it happily for years to come. If you haven’t yet signed up, I would love to have you sign up for my newsletter. Sent monthly, it contains updates about new fabrics I have in the shop and promotions that will run that month for newsletter readers. Sign up form is on the right side of your screen, toward the top. Linking to my favorites, each of which can be found at the top of the page, under Link Ups. 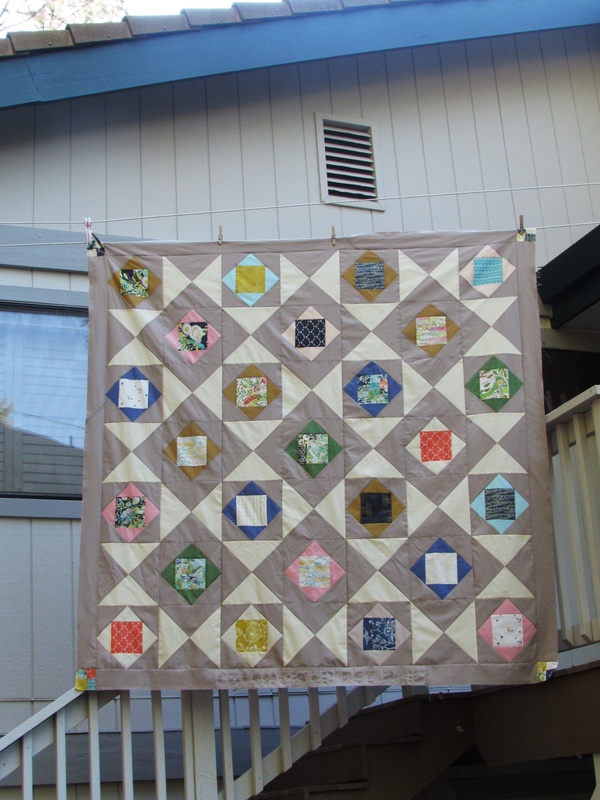 This entry was posted in Family, Free Motion Quilting, Pieced Quilts, Scrappy Binding, Straight Line Quilting and tagged barij, economy blocks, harmony quilt, hourglass blocks, millie fleur, relief quilting on June 15, 2017 by Bernie. The fabrics in this quilt worked wonderfully together. The background fabrics are Moda solids, Figtree Cream and Stone. I am not entirely sure how this rich and creamy, off white color relates to a fig tree but it is gorgeous. Maybe they were thinking of that creamy outer part of the fig’s flesh? Who knows. 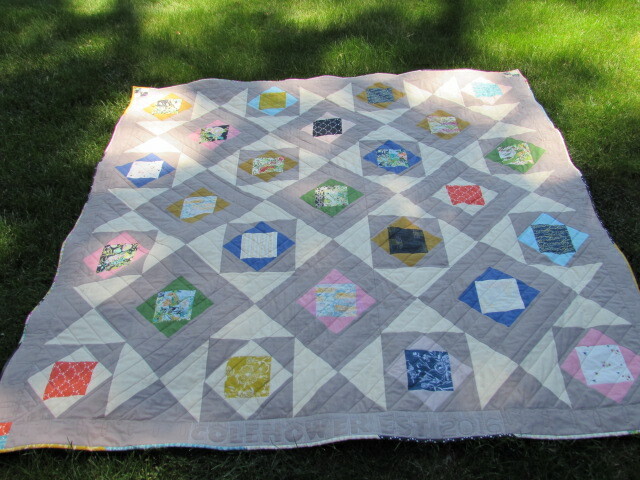 The centers of the economy blocks are from a fat eigth collection I received for my birthday. The Art Gallery collection, designed by Bari J, is Millie Fleur. 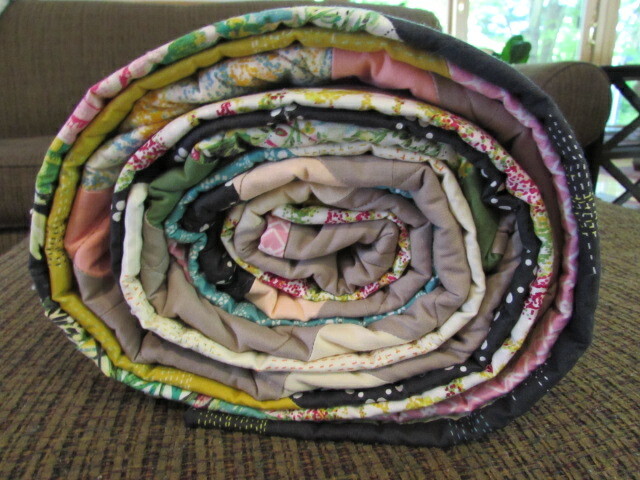 This quilt didn’t consume too much of the collection so I think I will use the rest to create a scrappy binding. (I love a scrappy binding!) 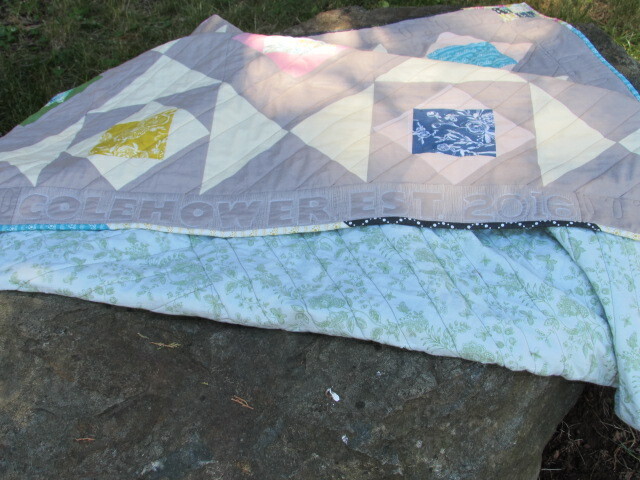 Along with the prints, I used a selection of solids from my stash to create the center of the economy blocks. The blocks are quite large at 10″ square. 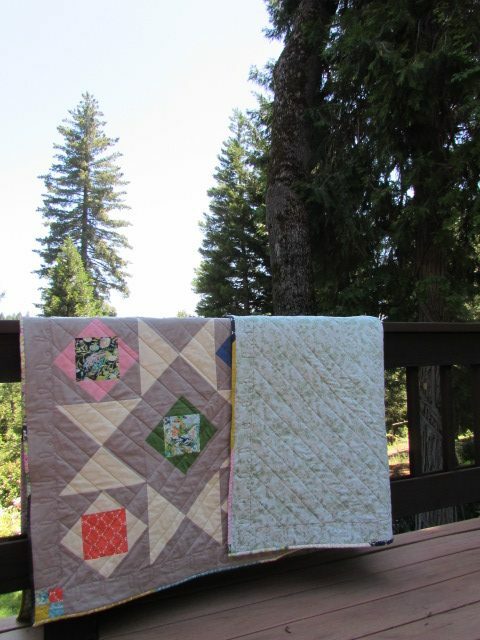 Looking at the secondary pattern (the cream and stone diamonds that surround the smaller economy blocks) will help me determine how to quilt it. The quilt is 70 x 70, so a slightly large lap quilt. Since I just took the long arm class, I plan to quilt it at the shop. It will be fun to quilt over all of that space created by the solid fabrics. 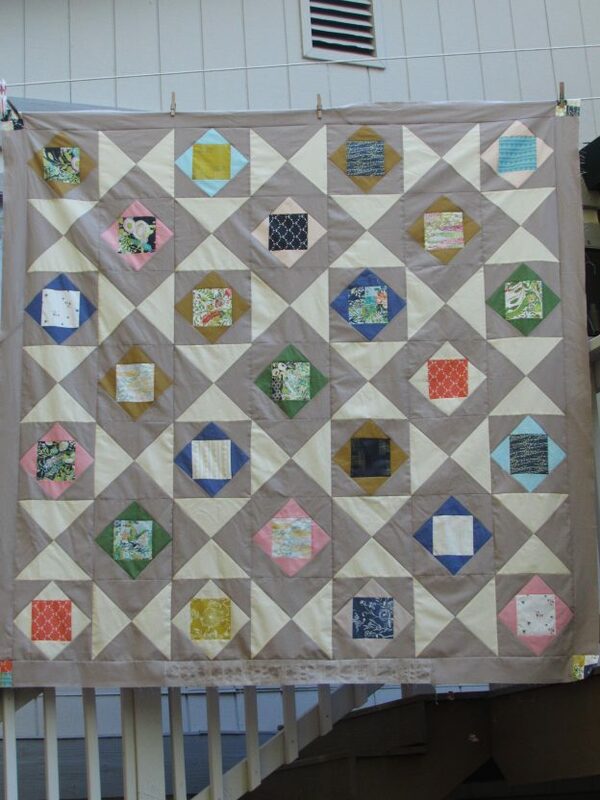 However, since it is a gift, I want to do one or two quilts as practice before I work on this one. I still have two tops waiting to be finished which will make for good practice sessions. There is a three inch border surrounding the blocks with four patch blocks serving as cornerstones. The bottom border looks distorted in this picture. I did some relief quillting there which I will show in the next post after I quilt this up. For now, just know that is why that portion looks a bit odd. 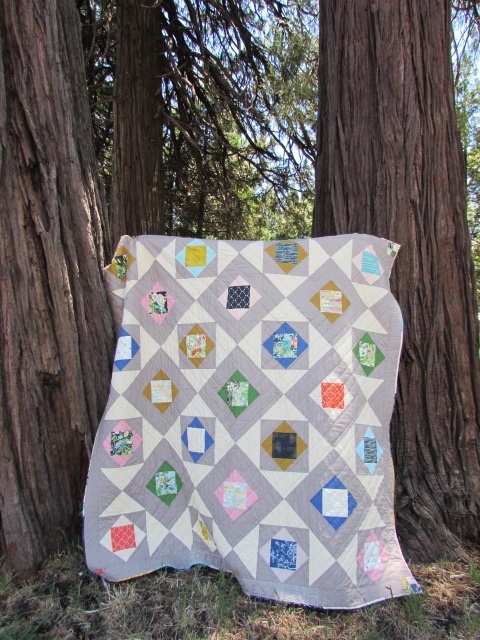 This was a bit of a beast to photograph, especially since my trusted quilt holder is back in school. Alas, I had to rely on my clothesline instead. Hopefully I will be able to reserve some time at the long arm shop next week to practice. I’m very much looking forward to that. Then when I am a bit more confident, I will finish this project. The weekend is coming and we don’t have anything planned. If it is cool enough outside, there is plenty of yardwork to be done. Not terribly exciting but that’s ok with me. Linking to my usuals. Find them at the top of the page, under link ups. 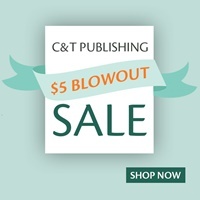 Have you heard about the $5.00 Blowout Sale over at C&T Publishing? It runs through Sunday, 9/11/16 and is a great opportunity to grow your sewing library for not a lot of money! Take a peek at the titles that are on sale this weekend. One of my favorites is Get Quilting with Angela & Cloe, a book about sewing with kids written by the wonderful Angela Walters. This entry was posted in Lap Quilts and tagged economy blocks, hourglass blocks, millie fleur on September 8, 2016 by Bernie.